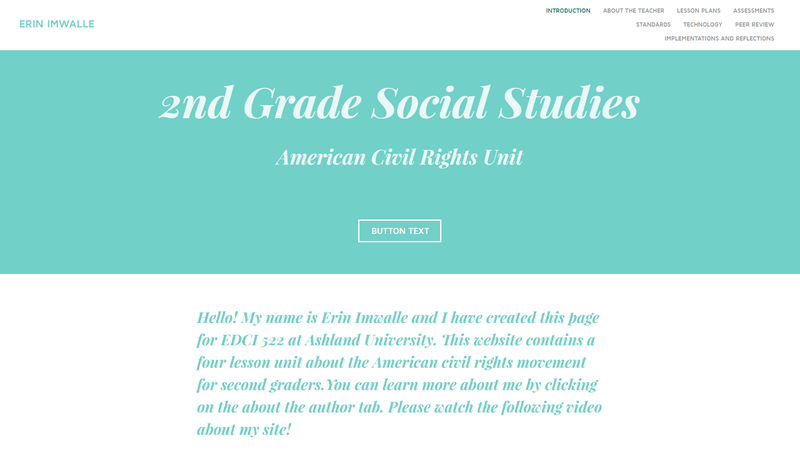 This unit is a four-day American civil rights unit for second graders. The first two lessons are an introduction to the subject. The third lesson allows for student discovery by completing a webquest. The final lesson will include students sharing a presentation with the class. Content Statement 4. Biographies can show how peoples’ actions have shaped the world in which we live. Weebly- Used to display thematic unit. Google Sites- Used for the webquest in Lesson 4. Google Forms- Used for peer review. Youtube- Used for overview video. Also used in dipity timeline and prezi presentation. Prezi-Used by the teacher in lesson plan 1. Dipity- An interactive timeline that students will use in groups during lesson 2. Glogster- Students may use glogster to make an online poster for their webquests.